I first met Martin Kaiser at the August 2017 Society of Wine Educator’s 41st conference in Portland, Oregon. Three months later Mark and I met him in Malbec country on the southern edge of Luján de Cuyo outside Mendoza, Argentina. Our purpose? To learn more about the wines of Doña Paula where he’s viticulturist and terrior lover. He conducted extensive vineyard research throughout the area to better understand the environment where Malbec thrives. 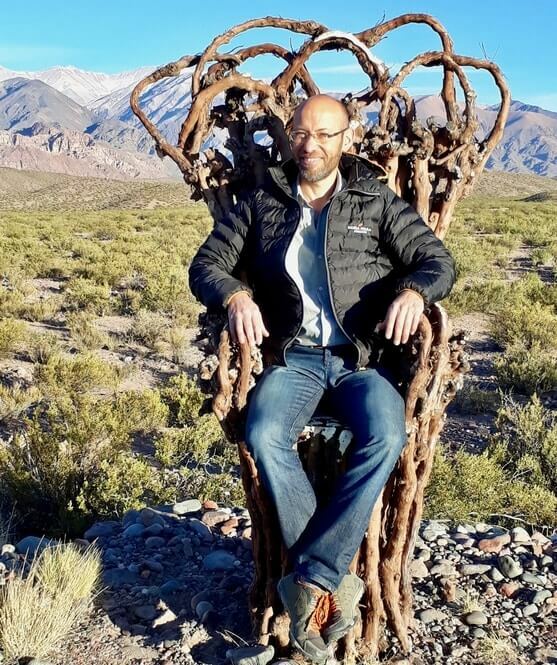 Mark attended the Mendoza GEiSCO conference last November- a perfect excuse to contact Martin! Doña Paula is a familiar name for some. The Bodega has 702 hectares of vineyards in the Mendoza area and an office in Mendoza City. Although a small receiving area is available to accept guests in Luján de Cuyo, they are not open to the public… yet. Malbec is their focus accounting for 50% of sales. They produce 100% Malbec wines, Malbec blends and other red and white wines. Doña Paula has a small receiving area outside Luján de Cuyo. A lovely, quiet spot in an expanse of vineyards. Mendoza City lies in the west-central part of the country around which 40,000 hectares (20%) of Malbec are planted. 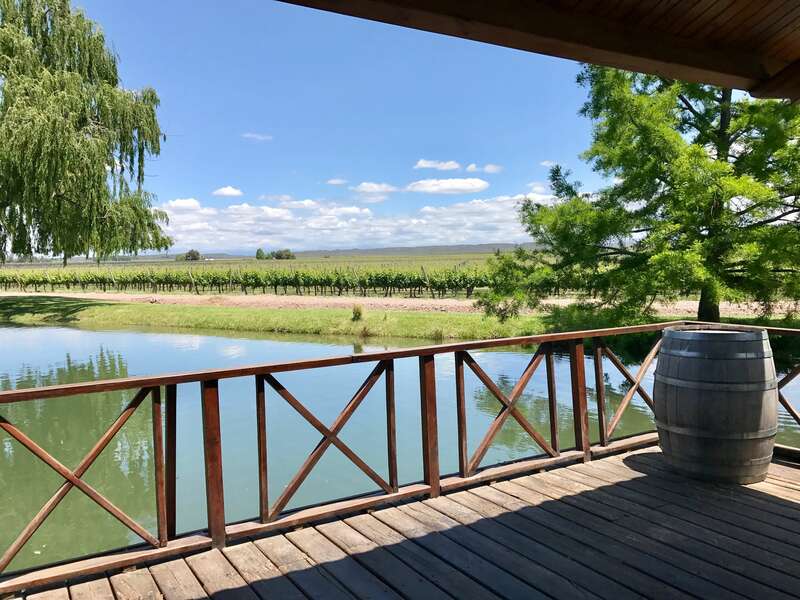 A startling 50% of Argentinian wine is produced just east of Mendoza in the drier San Martin area where a larger diurnal temperature swing is experienced. The Andes Mountains lie to the west of Mendoza and are a wall between Chili and Argentina, the later stretching for 5,000 k (3,000 miles). Head south of Mendoza City to Luján de Cuyo and you find the start of serious Malbec. Continuing southwest past Lujan you enter the Uco Valley, an area higher in altitude with cooler temperatures and differing soils. The departments of Tunuyán , Tupungato, and San Carlos are found there. With the location groundwork set, Martin dug into discussing terroir and soils of the area, and that of Doña Paulo. 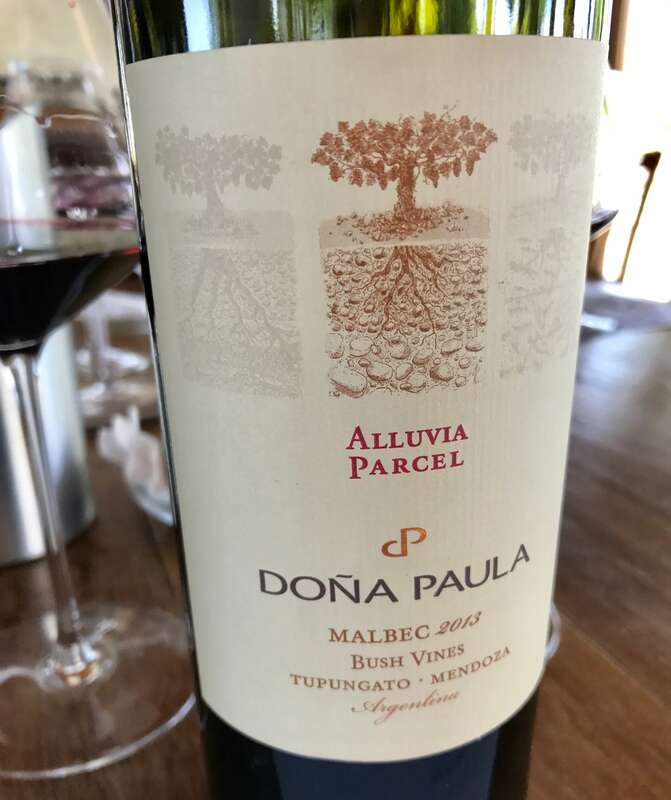 In the last five years Doña Paulo conducted vineyard studies to understand the differences in soil and temperature, and how they affect tannins. Note that generally, Mendoza and the surrounding areas see ample water supplies from Andes snowmelt thus water was not included in the study. What Martin and his team learned was not surprising; the mainly alluvial soils of Doña Paulo vary a lot. Most of the soil materials, especially near the mountains, are carried down by water. On top of this soil layer, you have a varying layer of material brought by the wind called Loess. Sometimes the Loess is so deep the plant isn’t able to interact with the alluvial material underneath. In other areas the Loess is thinner allowing vine roots to penetrate reaching it. The soils of Luján de Cuyo have on average medium texture loam ranging from clay-loam to sandy-loam. On the bottom, sometimes they present alluvial material at a deepness of 0.8 to 2 meters. Calcium carbonate concentration (calcaire, or limestone) goes from 2 to 3%, rarely forming a hard pan. Uco Valley presents lighter, sandier soils with almost no clay. In this case the alluvial materials appear from 0.15 to 1.5 meters deep. 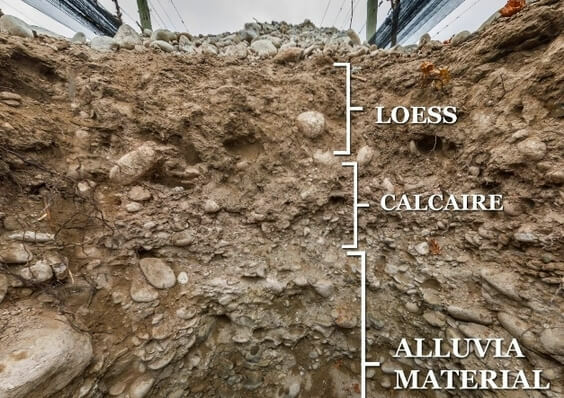 The limestone goes from 0% in recently formed alluvial soil up to 10% in older alluvial soils. And the limestone frequently forms hard layers 20 to 40 cm thick, most commonly located between the loess on top and the alluvial material on the bottom. For soil geeks or any interested party, there are informative 360° soil images here. Make sure you put the cursor on an image and move it around for the 360° effect! Soil Pits are commonly dug in vineyards to analyze types of soil. This one is in a Doña Paula vineyard showing loess, calcaire (limestone) and alluvial materials deposited by rivers. Having a good understanding of soils, and knowing how grape vines react to each, the Doña Paula research team looked at two factors effecting temperature: elevation and wind. Both have an effect on the wine. This was the backbone of Martin’s discussion. As you travel down from the Andes to the valley floor, things generally warm up. I say generally because of the Zonda wind– it comes into the valley daily from the mountains then out at night. Its strength depends on the degree of the slope- if steeper, the wind is stronger. The resulting air is cool to cold; colder air is denser and flows to the bottom of the valley making it quite cold. 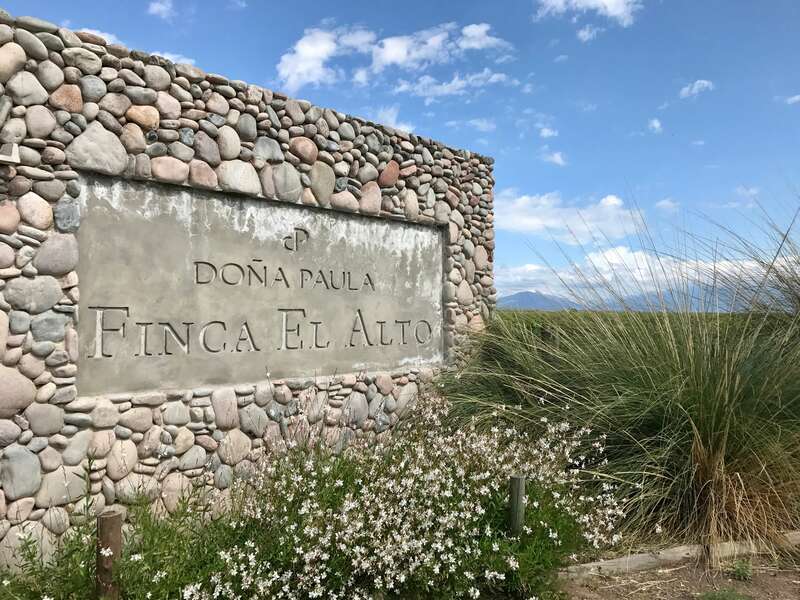 Doña Paula has two vineyards in Tupungato, an area in San Carlos in the southern Uco Valley: one at 1,300 meters with a vineyard slope of 5%, the other at 1,100 meters with just a 1% slope. The temperature difference is noticeable: on average there is a 17-degree Celsius diurnal swing in the lower areas, whereas the upper part has a 12-degree swing. During the day, the lower vineyard is 4 to 5-degrees warmer. At night, temperatures are similar with just a 1-degree difference between the two vineyards. How Do These Differing Temperatures Affect The Grapes? Grape ripening is similar in both Tupungato vineyards but tannins are softer in the lower vineyard where temperatures are warmer. On the contrary, tannins are firmer at higher altitudes where the temperatures are cooler. Based on Doña Paulo’s study in Tupungato and the whole of Argentina, temperature appears to be the most important factor effecting tannins. 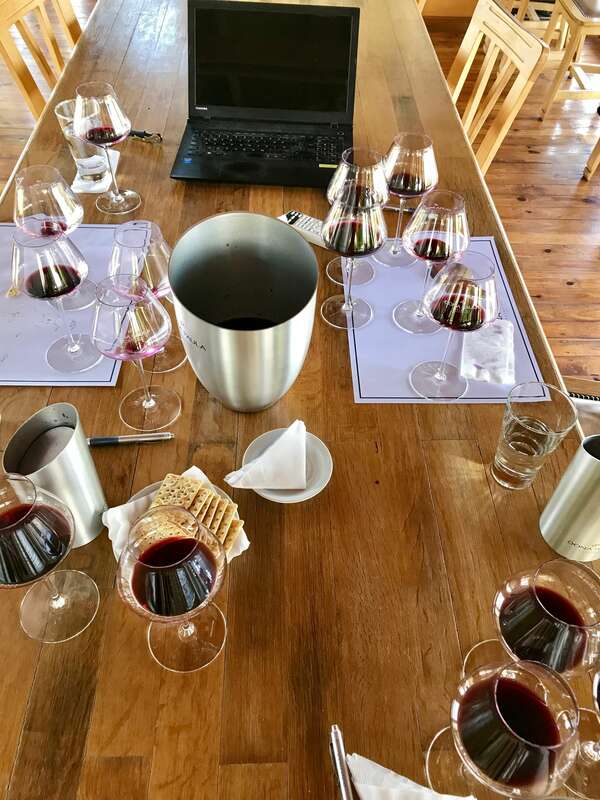 With a good understanding of soils, temperature, and how they affect tannins, Martin presented us with micro vinifications of 100% Malbec wines from different Doña Paulo vineyard plots at different elevations. All were from similar sandy, loamy soils. Right away, we noticed the color variation of wines from warmer to colder areas: warmer were deeper and denser while cooler less so. And aromas- as temperature increased the wines had fruitier aromas that followed through to the palate. As temperatures decreased, the opposite: spicier notes and fresher fruit with more palate complexity. 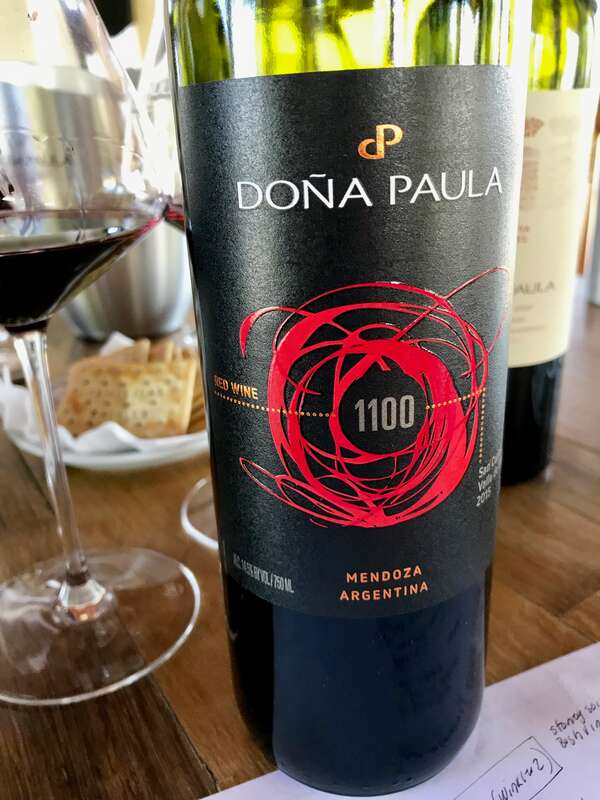 Wine #1: 620m (2,000 ft) elevation, vineyard location east Mendoza (slight earth, smoke, cherry, tree bark, dried herbs; medium minus, soft tannins). Wine #2: 680m, vineyard location east Mendoza (slightly fresher, fruity with cherry and plum, dried herbs, slight floral; smooth medium tannins). Wine #3: 1,000m, vineyard location Luján (blackberry, cherry eucalyptus, violet, rose; medium tannins, more prevalent rustic texture). Wine #4: 1,100m, San Carlos location in Uco Valley, area with large diurnal swings (fresh and crunchy black berry, plum and cherry, violet, spice; medium tannins, rustically smooth like crushed velvet). Wine #5: 1,320m (4,300 ft), Uco Valley location (black berry, black current, dried thyme, spice box, dried flowers; medium plus tannins astringent on front teeth but not drying). Martin shared additional Doña Paulo wines, most not available in the US. Here are two particular standouts. Grapes: from 3 blocks within their Los Indios Vineyard in the Uco Valley. The nutrient poor sandy soils have good drainage. Days are warm while nights are cool. Vinification: Grapes are hand-picked then de-stemmed gently, not breaking the berries. Each variety separately undergoes cold maceration in stainless steel tanks to extract primary aromas. After alcoholic fermentation is complete, the blend is determined. Ageing is done in 20% new French oak barrels for 14 to 16 months. A ruby-purple deep color, bright lifted aromas of black fruits- berry, cherry, plum- and clove made this hard to put down. Dark fruits dominate the palate with mixed peppercorn and pimenton hints. Structured with medium tannins, the wine grabs ahold of your taste buds initially then smooths, flavors lingering. This plot selection is 2.4 hectares (6 acres) within the Alluvia vineyard in the Uco Valley. The nutrient poor soil has good drainage: medium-sized alluvial stones covered with a calcium carbonate coating, intermingled with sand and limestone encrustations. The area has cool days and cold nights. Vinification: The grapes undergo a double sorting process, first by bunches then berries. Selected berries are placed in a temperature-controlled room at about 20°C where fermentation (alcoholic and malolactic) using wild yeast culture takes place. Post-fermentative maceration lasts 15 to 20 days. Then the wine is racked to 50% new French oak barrels and aged 20 to 22 months. Deep purple with a ruby rim, this wine was highly aromatic! Very fresh black berry, plum and red cherry aromas opened up presenting cinnamon, cedar and light minerally notes after five minutes. A spicy and savory- almost meaty- palate with a big, round mouth feel. Medium firm tannins start lightly tactile then smooth like crushed velvet-like. This was by far the most educational of winery visits in 2017. Mark and I explored Mendoza in 2015 but not to this extent. We learned a great deal including higher vineyards aren’t necessarily cooler in the Uco Valley, and temperature appears to be the most important factor affecting tannins in Malbec. If you like to dig into details, we highly suggest visiting Doña Paula. Whether a soil geek or not, beware- the wines will entice you with their variety and complexity! A huge thank you to Martin and Doña Paula! Martin’s seminar at SWE2017 was one of the most interesting I attended. Thanks for this great recap, especially the importance of the different soil types. Excellent post! Thanks Lauren, Yes his session was stellar. He’s a wealth of knowledge! Wow, I happened upon this preparing for a trip. Great information about the terroir, etc. in/around Mendoza and the research done by Martinvand his team. I’m aware of Doña Paula but as you say didn’t find they’re available for visits. Perhaps I’ll try and contact them!